This article was not rendering correctly in Firefox 4.x due to a change in how that browser handles MathML. This issue has now been fixed as of May 1, 2011. The Matrix Construction Set allows you to make a pixel perfect transformation by just dragging and dropping objects around. The CSS3 transform property can do some really cool things - with it, web designers can rotate, scale, skew and flip objects quite easily. However, in order for deisgners to have fine-grained, pixel level control over their transforms, it would be really helpful to understand how the matrix() function works. With the matrix() function, designers can position and shape their transformations exactly where they want to. The problem is, not many people actually understand what the numbers in the matrix filter actually mean. To solve this issue, I have created a tool, which I call the CSS3 Matrix Construction Set that can take any block-element, positioned anywhere on the page, transform it anywhere else on the page using the matrix() filter, and reveal the correct CSS code for this operation. Look at the tool now and if that is all you are interested in, you can stop there. However, if you what to know what the numbers in the matrix() function actually mean, and why you want such knowledge in the first place, read on. I'll try to explain this as simply as possible (and please feel free to use the feedback form if you have any opinions on how to make this article better). Note: This tool works in all modern versions of Firefox, Sarari and Chrome. Although it is not usable in Opera (due to its lack of support for HTML5 drag and drop) the CSS code it produces in other browsers is usable in that browser. The tool also does not work in IE since neither that browser, nor my CSS3 polyfill library, cssSandpaper, support the transform-origin property. I hope to fix cssSandpaper to implement this in a future release, but in the meantime, please read the note at the end of this article for a workaround for this issue. Matrices: Why Should I Care? (Note: I have ignored the vendor-specific variants (e.g. moz-transform, etc.) for the sake of brevity). If you know exactly how you want your transformation to look, it'll take a bit of fiddling around to get it to look how you want using the other transform functions, and it may not be pixel perfect if you lack patience (like I do). However, using a tool like the Matrix Construction Set, you can place the transform exactly where you want (This is analogous to using a color wheel to choose RGB colors for you, instead of using keywords like red, green or peachpuff). But this link, which shows the object's computed style will reveal that internally it stores a matrix() function. Ok, What Does The Markup Look Like? Note the difference with the Firefox implementation of matrix() — the last two elements need the px units after it. For now, think of it is a difference in notation, but we'll explain why this is later. In order to explain what they mean, I will have to define a few math-concepts here. Don't panic if you are mathematically challenged. These concepts are not that hard to understand, but there is a bit of explanation needed. Why should you torture yourself if you hate math? All those matrix jokes you hear at parties will suddenly start to make sense! Finally you'll be able to understand why all the geeks at work find this XKCD comic so funny. That's nine numbers! So how come the CSS3 matrix() function only has six? Got it? It's pretty simple, right? Note that when we write (x, y) co-ordinates like ( x y ) , we call ( x y ) a vector. Vector notation can be written horizontally, (e.g. ( x y ) ) or vertically (e.g. ( x y ) ). When using them in 2D transforms, we always add an extra co-ordinate with a number 1 at the end. So (20, 90) would be written ( 20 90 1 ) or like ( 20 90 1 ) in vector notation. A little bit more complicated that the dot product, but not too bad. So, How Does This Relate To CSS3 Transforms? Although transform-origin doesn't work with IE, it is possible to generate the matrix in another browser and use cssSandpaper to generate the shape of the transform in that browser. In order to fix the positioning, one can use Paul Irish's conditional stylesheet fix to position that block manually in IE only (it is what I used on this page so that the matrix transform in my example above appeared correctly in IE). I hope to have transform-origin working in cssSandpaper soon so that it will be unnecessary to do this. In order to do this, one must use CSS3 3D Transforms. This is why the Matrix Construction Set only has three control points to drag around, not four. If you would like to see a version of the Matrix Construction Set to use matrix3d(), please let me know by leaving a comment below. I don't expect anyone to be an expert in matrix artithmetic after reading this article. But at least you know what those pesky numbers mean, and this information may become useful in the future. The equations on this Physics Forum post was quite helpful in the creation of the Matrix Construction Set. A blog post that has a bunch of math equations on it may be scary for web designers. My apologies. Your Mathjax script is just outputting a lot of [Math Processing Error] for me. Running Ubuntu 10.10, Chromium 9.0.597.42. What surprises me is that articles like this do not emphasize the connection between the vectors formed by a matrix’s columns/rows and the transformation itself. The vectors represent the new position of the basis vectors (1,0) and (0,1) after multiplying left/right (for the 2D case). They act as a skeleton for the underlying space. It’s the perfect way to explain matrix multiplication to visually oriented people, like designers. @Steven: Great comment – it is quite true what you say about all the matrix() articles on the subject and I agree that it would be great to show the relationship between the matrix and the actual transformation. In fact, I debated back and forth about how far I should go to explain the math behind the eye-candy, since my assumption is that a lot of designers don’t have a university mathematics background. After a lot of painful reading and re-reading of this article, I felt that it already had a lot of intimidating mathematical notation in it, and I didn’t want to overwhelm readers with a lot of concepts like “basis vectors”, “identity matrices” and “inverse matrices”. However, I do appreciate your point-of-view, since these and other algebra related topics can be useful when doing things like scripting transform animations, and I will keep it in mind when I update this article or when I write future posts on this topic. As a matter of fact, if you or any other readers are interested in articles covering topics related to matrix() or CSS3 Transformations, please post more suggestions below. Also, if you or any other readers have read/written other articles on these topics, feel free to share links below as well. @Ryan: Thanks for the bug report. I’ll endeavor to fix this in a future edit of the article (I do use Ubuntu a lot, but the article seem to display well in latest version of Chrome, so there must be a small difference between these two browsers that causes this). Thanks so much for taking the time to write this article. Thought it was clear, concise and informative. or add labels to the input fields please? @Oli: The two numbers in each row of the “from” column correspond to the (x,y) co-ordinate of the upper left, upper right, and lower left corner of the red rectangle. The corresponding numbers in the “to” column correspond to the corners of the green parallelogram. Thanks for the write up. I’ve found lots of information on the specs for different transformation matrix implementations (, ActionScript, etc…) but scant information on the math involved. 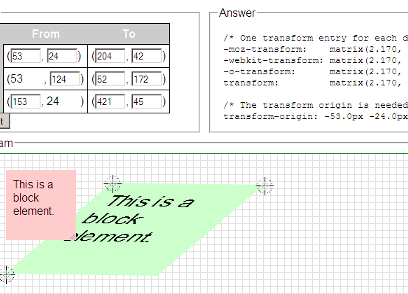 If on http://www.useragentman.com/matrix/ would be four corner drag, which ever block element could be transformed to any perspective. Could you Zoltan make such example? I have used nowadays a script that make use of image pixel or vector points for four-corner-drag. The guality is as good as it can be. In vector images the quality is of course exellent. Please test following swf. It takes glyph points of Times A-letter and when corners are dragged, original glyph points of undistorted figure are transferred to distorted figure points. The only problem here is the performance, because the script has to calculate new points always when the mouse moves. The swf example of one letter is fast, but when there are hundred of letters, the performance is poor. If using CSS3 3D transform, we have no need to traverse through every pixel or point. What do you think, could you make the four-corner-distort with CSS3 3D transform? Where this is mainly needed: I’m coding a helper program to translate balloon texts of comics so that the translator can self add texts. Some texts are in perspective, so there is need to four-corner-distort. The current platform is Flash/Flex, but it seem that nowadays the CSS3 has much more power than three years ago. The text is in Finnish, but there is image of every step, so it will be easy to follow. Any word on the 3D construction set? That would be epic! Thank you so much for the construction program and the information on matrix transformations! Make the boxes partially transparent/reduce the opacity. It would be nice to see what is happening to each box when they happen to overlap. It is too Mathematically Challenged to me. Zoltan, Im one of those math challenge individuals and your article is so awesome, I’m interested in reading more now. Have subscribe to your RSS, look forward to learning much more from you. Cheers. As Einstein once said (maybe not exactly, but as close to): “If you cannot write in a simple way about a subject, that’s because in fact you are unable to understand it.” Your explanation is simple and clear. I also want to learn about matrix3d through your clear explanations! I think your “translate” matrices under “interesting facts” are wrong. @Raul: Oops … totally right! Was a typo — thanks for pointing it out. Corrected. But seriously that’s a wonderfully helpful article that I’m very glad to have read and I really appreciate of you taking the time to write it! Though you’re right I don’t think I’ll be doing any of the maths ‘by hand’ but it’s handy to know what the number actually mean. It’s always annoyed me that microsoft’s “filter: progid:DXImageTransform.Microsoft.Matrix( … );” property was so difficult to implement when the comparative CSS properties were so easy. Now you’ve helped to shed light on both the ‘old-skool’ and ‘nu-skool’ methods. Great article, just what I looked for ! Thanks for all these explanations, I’m one of these Math-hater but a CSS-lover and I didn’t understand what these 3 numbers meant. If you are always motivated to do the matrix3D tutorial, I’ll follow this ! (I try to make an animation of a door which opens. Done it but with a fake 3D perspective and effects… McGyver-style). Through your blog I know CSS3 matrix calculation principle, thank you very much. But there are a few parameters of Matrix I don’t understand which in the bottom line of matrix mun ( 0 0 1 1 ),is these number is default or mean sth. Nice refresher on some math I haven’t needed to use since high school! A very useful article, concise and to the point. I was searching for the meaning behind the matrix numbers when all the property sheets I’ve seen assume you already know this. One read of this article and BAM! ..enlightenment!! Thank you sir and much appreciation for linking the matrix construction set. Used it for to make an effect of a falling shadow from a headline, purrfect! instead of 0×200+0×0+20×1 and for (0,80) it should be 0×0+0×80+1×1 instead of 0×0+0×80+20×1. This is very interesting, but for the non-math person it would be good to see something in action after you set you matrix constructor. We have the matrix info, but not relative to any objects. Thanks though. I’m a little more confused than I was about matrix, but I think closer to finding out what it actually is. @Parker: Thanks for pointing out the mistake .. this typo has been corrected. Nicely explained, thank you from Brazil!